09-23-2008 - Team BBNova showed up in Atlanta early Friday morning for some test passes to get a feel for the conditions there. Myself, Brian, and my wife Colleen unloaded the trailer and waited for my brother Chris to show up from the airport as he is a pretty pretty princess and couldn't do the drive. 1pm came and the call was made to come to lanes to make our first test pass. We decided to make only 1/8th mile passes as we would learn everything we needed to. After a 1.16 60' spinning the tires, it went 4.85. Not bad, but we just tested a couple weeks ago and the 60' was a heck of a lot better than that. Brian's observations of the starting line were the track was not there. We made a couple more changes and 2 more passes and closed up shop to get some sleep as we only got a few hours of sleep on the way there. We got the track around 8am and got everything ready for first round of qualifying. With the air around 1500 ft we made a tuneup choice and made our way up to the lanes. With Brian and Chris by my car, they made sure I ready and lined up. With a safe tuneup the car went 7.50 @ 183.5mph. I'm not sure if you caught it or not but I didn't mention Colleen. Colleen was enlisted by Scott Sparrow of the NMCA to take pictures for the them. Although very pleased by the past run, it was done next to Jim Widner who busted off a 7.41 which made my 7.50 pass look slow. After round one Jim was #1 with his 7.41 and we were #2 with our 7.50 pass. After a 2 more rounds of the NPS competitors playing the I don't want to be on the Jim Widner side of the ladder qualifying, the qualifying ladder didn't change much. Soon after our 3rd qualifier, it was time for the previously scheduled NPS meeting to talk about making a couple tweaks to the rules to get a little more parity. The meeting went well although all issues were not finalized. The ladder was set for tomorrow's racing and I thought we had the beautiful 71 Nova of Bob Briscoe. Turned out I was wrong. We showed up early Sunday morning to get things ready and got a chance to see the ladder. Looks like we had Barb Nesbitt first round. We tuned it up as Barb has gone as fast as 7.56 this year so we knew we had to be on our game. 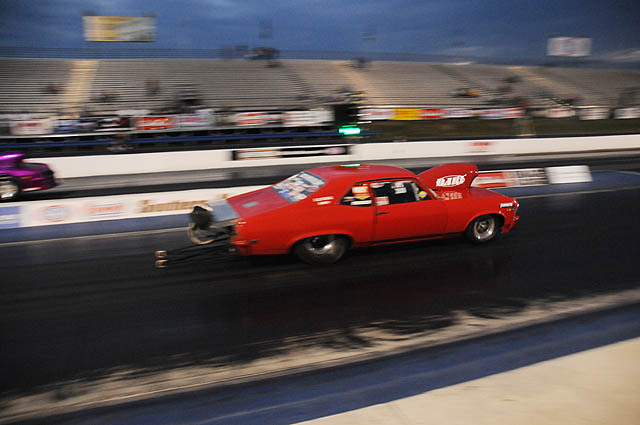 Not mention the schooling she gave Colletta on the tree the past event art Milan dragway. The call was made around 12:30 for first round so we towed up and waited for Barb to show up. All the competitors were there with the exception of Barb. I got on the phone to her daughter Susie and asked where her mom was? She informed us we had a bye that round as she hurt the motor yesterday. Although sad for team Nesbitt, it gave us a chance to try something that round. Chris hurried back to the trailer and we made a couple changes. It must have liked them as the car went 7.50 again but at 186 mph. That round advancement gave us our bye run for second round as the sportsman #2 qualifier position dictated. We waited for what seemed like half the day for the call for second round, as the NMCA had a very large car count of bracket racers at this event. We made another change to try and headed up for second round of eliminations. This round set Widner against Rickart, Beeson against Colletta and us with our single. Widner was first to put Rickart on the trailer followed by Beeson taking out Colletta. With Widner's 7.522, I thought we should be able to come close to that for lane choice as we had Widner next round. I did the burnout. Brian and Chris got me in the groove and all set to leave. The lights came down and got her down the track with a 7.529, just shy of having lane choice. Once we made it back to the pitts, Jeff from the NMCA came around to all competitor to inform us we had only 25 minutes till next round. We turned the car over fast and had a few minutes to spare. The call was made and headed up to the lanes. #1 qualifier Jim Widner and I paired up as Beeson followed behind as he had his bye run. The Super street class ran so Jim and I were next. Jim choose the left lane and we did our burnouts. We backed up and prepared for battle. Jim took a bit more time then us so I staged first. Jim bumped in with his prestage bulb. I final staged and Jim followed. The lights came down and Jim was soon left behind us. I pulled the gears and kept her in the groove hoping for Jim to not come around us. I passed the finish line while pumping my fist as I saw the win light come on in our lane. What a matchup. Turns out Jim had a .007 reaction time while I had a .003 light. While talking to Jim on the return road before the tow vehicles showed up, he told me he spun on the line and it was over from there. We were not supposed to advance past the semi's, but we did. The finals would bring team BBNova minus Chris and Colleen as she had to take Chris to the airport so he could make his flight against team Beeson. We had lane choice and were ready for another battle. Brian and I prepared the car and waited for the call for final round. The call was made and we made out way to the lanes for the last time that Sunday. We had lane choice so we put Beeson in the left lane as the right lane looked a bit better to Brian. Dave and I staged and the lights came down. I let go of the trans brake button and the car left leaving Beeson behind. For the last time I pulled the gears and crossed the finish line first with a 7.57 to Beeson's 7.67. The win was bitter sweat as Chris and Colleen could only be told over the phone that we had won. Please support these companies as they make the best products out there and make all this possible.